I wanted to personally thank all of you for taking care of my husband and getting him to his final resting place. The professionalism and caring of Staab Funeral Home goes without saying. At Staab Funeral Homes, we cater our services to your needs. We want to help you celebrate your loved one and what made them so unforgettable, so we offer a variety of service options to meet every budget. Both the funeral and memorial service are ways to celebrate life. There are several forms of disposition including cremation and burial. Planning is a very important part of life. Personalization is a way to make a funeral service more meaningful. Death has a way of bringing families together. Often, it has a way of bringing us home. Our nation’s veterans, police officers and firefighters deserve special consideration, and special care. Our care for you does not stop just because the funeral is over. 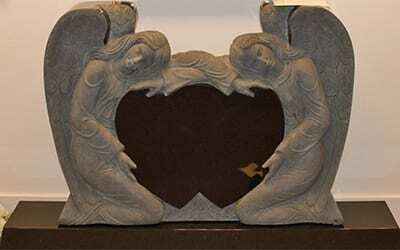 Our monuments are crafted in vivid granite colors selected from quarries all over the world. Like you, we have a special place in our hearts for our pets.